Rory McIlroy posted this 125 Kg lift video in response to Brandel Chamblee's "Tiger" concerns. Brandlee Chamblee said on the Golf Channel something to the effect that he was concerned that Rory MicIlroy was getting a little Tiger like with his love for weightlifting in the gym. That pissed Rory off a little and he posted this video and tweet tagging Chamblee. He then explained his gym routine with the note that he's a golfer not a weightlifter. Update: Exactly what Brandel said from Shak. "The only thing that gives me concern with regard to Rory going forward I say it with a lot of trepidation, because it's a different era for sure. And I don't know the full extent of what he's doing, but when I see the things he's doing in the gym, I think of what happened to Tiger Woods and I think more than anything as much as what Tiger Woods did early in his career with his game was just an example of how good a human being can be, what he did towards the middle and end of his career is an example to be wary of. That's just my opinion. 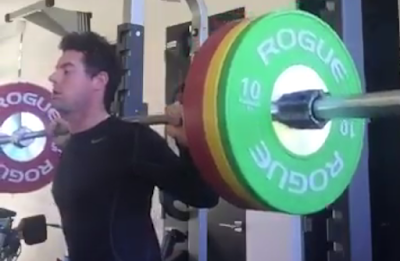 And it does give me a little concern when I see the extensive weightlifting that Rory is doing in the gym."